DETROIT --- Visteon Corp. today spurned Johnson Controls Inc.'s $1.25 billion unsolicited cash offer for the bankrupt supplier's interiors and electronics units -- and questioned JCI's motives. "The proposal continues to lack important information and remains highly conditional," Visteon said in a statement, issued about two hours after JCI disclosed its bid. "It is unclear at this point whether this proposal holds out any real prospect of enhancing value to Visteon's constituents." Visteon said JCI's offer stirred up a history of strained relations and accused its rival of attempting to disrupt its exit from bankruptcy. JCI "is a direct competitor that stands to benefit by introducing delay and complexity into the Visteon reorganization process," Visteon said. "Visteon has had extensive and difficult experiences with (JCI) in prior transactions. We are mindful that exploring a transaction of this size and scope at this time could distract the company from its primary objective of completing the ongoing reorganization process in a manner that enhances value for all of our constituents." Visteon said it expects "further dialogue" with JCI, but that it would continue to pursue plans to emerge from Chapter 11 soon. JCI, in its statement, said it first approached Visteon about the deal in January, and again on May 7 and May 20. Jacqueline Strayer, JCI’s vice president of corporate communication, said JCI went public today because it wanted to make its interest known before Visteon’s reorganization plan hearing on Monday. Visteon's presence in China's automotive interiors and electronics market is a main driver of the interest, JCI said in a statement today. Combining Visteon's Chinese operations with JCI's 23 joint ventures and 40 manufacturing facilities in that nation could generate more than $7 billion in revenue for JCI's automotive business in 2011, JCI said. “We believe that Visteon's interiors and electronics businesses would be an excellent strategic fit with our automotive experience business,” JCI CEO Stephen Roell said in the statement. In recent months, Visteon and its creditors have been sparring with shareholders over the company's reorganization plans in U.S. Bankruptcy Court in Wilmington, Del. The next hearing is set for Monday in Wilmington. Visteon, which was spun off by Ford Motor Co. in 2000, makes automotive electronics, lighting systems, and climate control products. It struggled last year under a heavy debt load during a time when automotive production volumes were at the lowest levels in decades, dragging down revenue. Prior to filing for Chapter 11 last May, Visteon had never posted full-year net profit since the Ford spinoff. 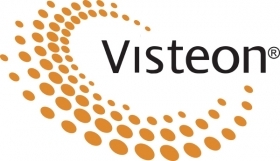 Visteon posted net income of $184 million for 2009. This was driven mostly by cost-cutting, including a $195 million fourth-quarter gain from terminating retiree health- care benefits. MILWAUKEE, May 21 /PRNewswire-FirstCall/ -- Johnson Controls, Inc. (NYSE: JCI) announced that it sent a letter yesterday to Visteon Corporation expressing interest in acquiring Visteon's interiors and electronics businesses. Johnson Controls is offering $1.25 billion in cash for the businesses, subject to due diligence, the execution of a definitive agreement and the approval of the Johnson Controls Board of Directors. "We believe that Visteon's interiors and electronics businesses would be an excellent strategic fit with our Automotive Experience business," said Stephen A. Roell, Johnson Controls Chairman and Chief Executive Officer. "This acquisition would significantly expand our automotive interior technologies and capabilities. It would provide global scale and complementary products to our automotive electronics offerings. Importantly, it would broaden and deepen our global automotive customer relationships." Visteon interiors and electronics businesses are leaders in the fast-growing Chinese automotive interiors industry. Johnson Controls, with 23 joint ventures and 40 manufacturing facilities in China, is the leading provider of automotive seating systems. In China, both Visteon and Johnson Controls do business primarily through non-consolidated joint ventures. With the addition of Visteon's operations, Johnson Controls Automotive Experience consolidated and non-consolidated revenues in China could exceed an estimated $7 billion in 2011. Visteon's major customers and Chinese joint venture partner support the transaction, according to Johnson Controls. The company said it believes its offer would provide superior value to Visteon's stakeholders and that it could move quickly, assuming Visteon's cooperation. It also said it expects the acquisition would have meaningful cost synergies. Johnson Controls initially contacted Visteon regarding its interest in the interiors and electronics businesses in January 2010 and made subsequent contacts on May 7 and yesterday. No other terms or details of the proposed transaction have been disclosed, pending customary due diligence and negotiations. Wachtell, Lipton, Rosen & Katz and JPMorgan Securities have been retained by Johnson Controls to assist in the transaction. Forward looking statement: Johnson Controls, Inc. ("the Company") had made forward-looking statements in this document pertaining to its financial results that are based on preliminary data and are subject to risks and uncertainties. All statements other than statements of historical fact are statements that are or could be deemed forward-looking statements and included terms such as "outlook," "expectations," "estimates," or "forecasts." For those statements, the Company cautions that numerous important factors, such as automotive vehicle production levels, mix and schedules, the strength of geographic economies, currency exchange rates, cancellation of or changes to commercial contracts, the ability to complete proposed acquisitions, as well as other factors discussed in the Company's Form 8k (filed March 9, 2009) could affect the Company's actual results and could cause its actual consolidated results to differ materially from those expressed in any forward-looking statement made by, or on behalf of, the Company. Despite Visteon's request for additional clarification in a May 17 letter to Johnson Controls, the proposal continues to lack important information and remains highly conditional. It is unclear at this point whether this proposal holds out any real prospect of enhancing value to Visteon's constituents. This proposal has surfaced very late and at a critical point in our Chapter 11 process. Johnson Controls is a direct competitor that stands to benefit by introducing delay and complexity into the Visteon reorganization process. Visteon has had extensive and difficult experiences with Johnson Controls in prior transactions. We are mindful that exploring a transaction of this size and scope at this time could distract the company from its primary objective of completing the ongoing reorganization process in a manner that enhances value for all of our constituents. Visteon's customers and global joint venture partners have been extremely supportive throughout the reorganization process and support the company's goal of a near-term emergence. Although Visteon anticipates further dialogue with Johnson Controls, the company will continue on its path toward emerging from Chapter 11. Visteon's disclosure statement hearing is scheduled for Monday, May 24, in U.S. Bankruptcy Court in Wilmington, Del. Visteon Corporation is a leading global automotive supplier that designs, engineers and manufactures innovative climate, interior, electronic and lighting products for vehicle manufacturers. With corporate offices in Van Buren Township, Mich. (U.S.); Shanghai, China; and Chelmsford, UK; the company has facilities in 25 countries and employs approximately 28,500 people.